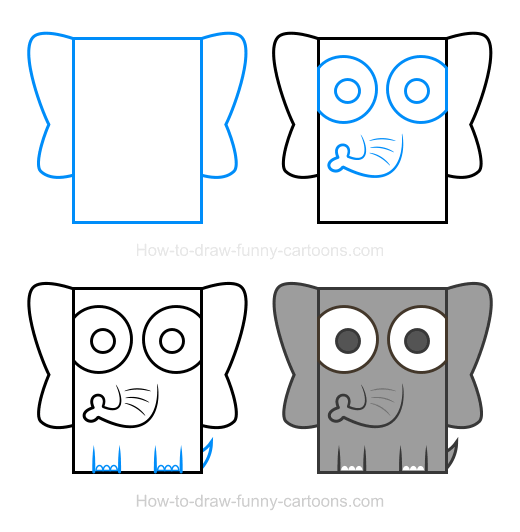 If you want to illustrate a simple elephant clipart using a basic template easy to duplicate, then please take a moment to try this drawing lesson. 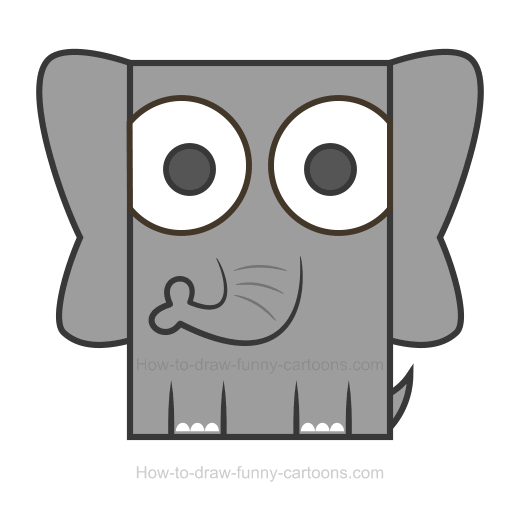 It offers everything you need to help you draw a cute cartoon elephant in minutes! You can see the final illustration below. Elephants are fascinating animals. They are tall, quite heavy and easy to recognize with original features like a long trunk and large ears. Elephants also have 26 large teeth and a tough skin. They are mostly found in Africa and Asia. These animals are also quite intelligent and are also known for being able to use basic tools. Let's start this drawing lesson now! First, create a large rectangle made from a thick outline. 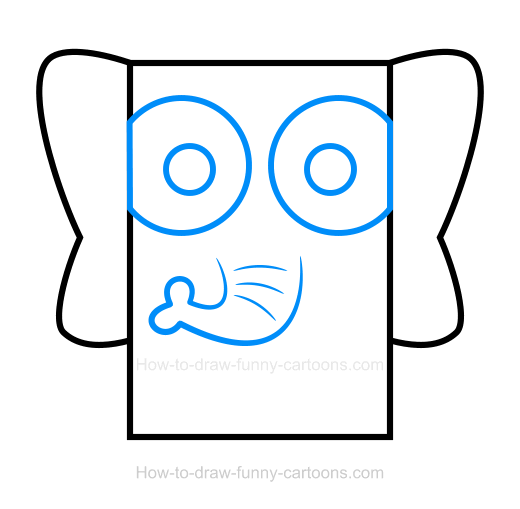 This rectangle is used to form the body and the head of the cartoon character. Then, draw two large ears using several curved lines. When you are finished, you can proceed to the next step. Now the fun begins! Continue your good work by drawing two large circular shapes to form the eyes of the animal. Pupils are made from additional (but smaller) circles. Finally, you can complete this step by adding a long trunk made from a single curved line just below the eyes. On the trunk, you can use three small lines to add a little bit of texture. 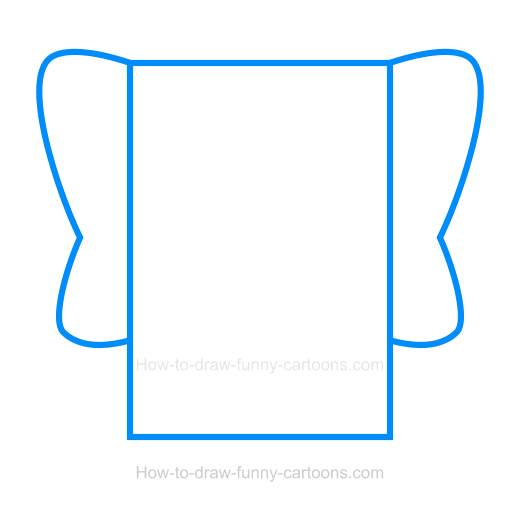 In this final step, you can draw a pointed tail using a small triangle made from curved lines. 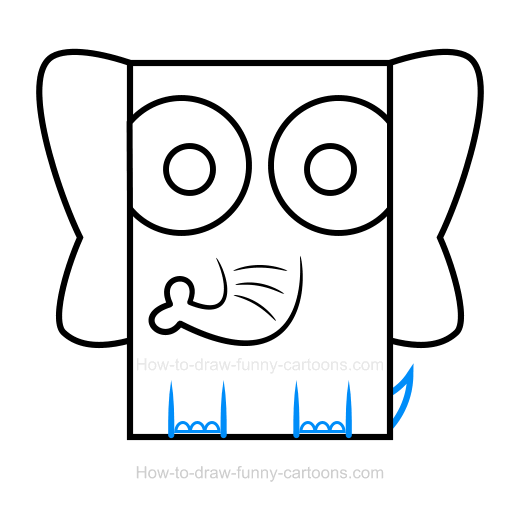 On the bottom of the rectangle, you can also draw the legs using four straight lines and six circular shapes. That's it for the drawing part of this lesson. Now, we can work on colors to give more life to this cartoon illustration. This cartoon character is mostly filled with white and grey colors. The eyes are white, just like the small circular shapes found on the legs. The pupils are filled with a dark grey color while the rest of the illustration is colored with a lighter grey color. Drawing this elephant clipart was a fun experience!